I built a working prototype XBRL-based financial report validation tool in Excel probably four or five years ago. That tool was used to test the feasibility of some ideas which I had. Those ideas have turned into commercially available software products/solutions. One software vendor, for example, offers a suite of validation products. Another commercially available product is being made available. And I have been working with another software engineer to test some other ideas. These tools might look like toys. But if you understand disruptive innovation and you look closely; you will realize that these are far from toys. This is experimentation that will lead to new products and services. I have updated my older prototypes and synchronized them very closely to the commercially available validation products for my fundamental accounting concept relations continuity cross checks. You can get Excel spreadsheet applications that currently cover almost 70% of all public companies that submit XBRL-based financial reports to the Securities and Exchange commission. Here is the VBA Code if you want to check the code before you download or run the macros. All the spreadsheets have basically the same code, just different mapping rules, impute rules, and consistency check rules. All the spreadsheets basically work the same, they just have different metadata for the different reporting styles of public companies. You can use these spreadsheets to analyze across entities like in most of the examples that I have provided. 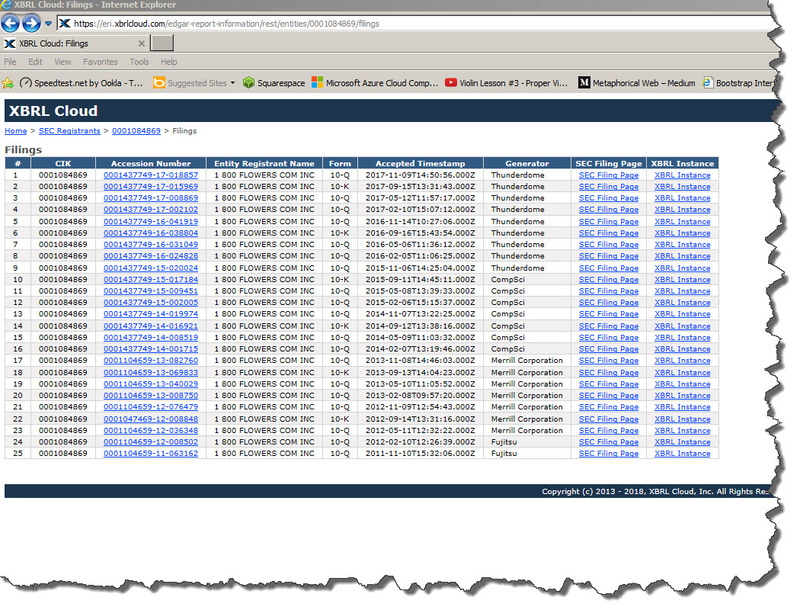 But, you can also analyze all the filings of one company across all their filing periods. NO ERRORS EVER: Apple, Google, Urban Outfitters, and Red Hat have never made an error related to the fundamental accounting concepts continuity cross checks. ERRORS FIXED: AT&T is an example of a public company having errors; but the errors were subsequently fixed. To make the Excel based tools work, you have to get the URL of the file you want to validate or you can put the full path to any local file you want to validate. You can get file locations from the SEC EDGAR system, from XBRL Cloud's EDGAR Dashboard, using an API such as XBRL Cloud's (human readable, machine readable); lots of different ways to get the files. You have to understand the reporting style of the company. Here is a list of reporting styles for all public companies (not all styles are supported yet). Notice the URL; select from the list or just put in the beginning of the name of the company and you will get a list. XBRL Cloud has an API for getting this information as well. From the list of reporting styles you can get to a summary of the reporting style; here is the main entry point of the metadata. Again, the metadata is near commercial quality. I am not sure how close I will make this, I don't want to take away business from people who have existing commercial products. Companies that are going to file with ESMA are going to need similar functionality. Ignorance is defined as a "lack of knowledge or information". All this information is an excellent opportunity to vanquish ignorance related to how XBRL-based digital financial reporting actually works. What I discovered from all this poking and prodding of XBRL-based financial reports submitted to the SEC is that validation metadata is the same metadata that you need to extract information from those reports effectively. But don't believe me. Fiddle with the Excel spreadsheets. They are great learning tools. The code is terrible and you can clearly undrestand the problems of embedding business rules in software code. Bad idea.